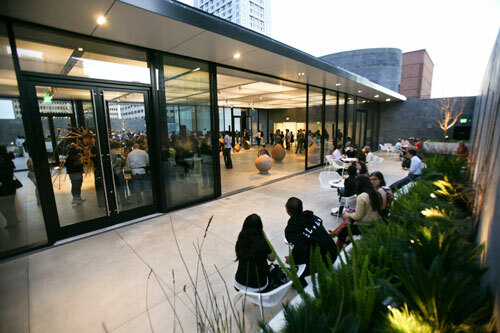 The third Thursday of the month SFMOMA has an event series called Now Playing. Now Playing is curated by Frank Smigiel and features food, performances and experimental projects designed to catalyze interaction. It’s really about engaging with the museum itself as a total work of art. says Smiegiel. It’s also a party, and like any party, you really have to be there. So on June 17th will be a party you must attend! Sponsored by Blue Bottle Coffee and Meatpaper Journal, the party will feature a musical performance by Chris Johanson and the group 17th & Capps, in celebration of the release of Johanson’s new project, THE THING Quarterly – a periodical in the form of an object. Exactly what THE THING will be is a secret but guests can purchase the issue at the Museum Store on the day of the event. Also on the agenda are special projections of home movies and moon-rises created by Johanson himself along with edible flowers and other floral-based menu items on the museum rooftop from Bi-Rite’s Morgan Maki and Linh Phu and Leif Hdendal and Chris Kronner of Bar Tartine. Complimentary beer and wine will be served courtesy of Trumer Pils and Scribe Winery. 6:00 p.m. – 9:45 p.m. Rendered in:0.0328 seconds with 7 queries, using 253 k / 462 k.